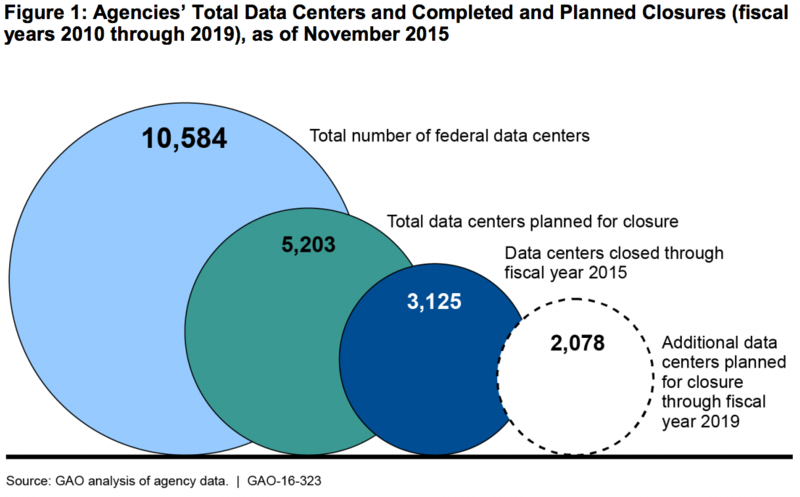 This figure from GAO’s report shows that roughly half of all federal data center a slated for closure and that, in fact, almost 1/3 of federal data centers have already been closed. So, by this metric, agencies are making good progress. In 2010, the Office of Management and Budget (OMB), the fiscal watchdog within the federal government, issued an order requiring that federal agencies consolidate data centers in order to save money and reduce redundancies. Twenty-four agencies, including elements of the Departments of Homeland Security, Treasury, and Defense, were tasked with identifying data centers under their purview, then to determine which could be closed and at what cost savings. Six years later, these agencies have collectively identified 10,584 data centers, of which 3,125, or about 30 percent, were reported closed as of the end of FY 2015. Another 2,078 were slated to be closed by the end of 2019, for a total of 5,203, or just shy of half the total number. The GAO report indicates numerous pathways to improvement, noting, for example, that across the spectrum, only about 5 percent of federal server space is actually being used. OMB has recommended but not yet put in place a uniform metric for server utilization, which would seem to be a first step toward improving the efficient use of computer resources. Perhaps surprisingly, in response, the Department of Defense has stated that it “is moving toward commercial cloud hosting services to enable the migration of workloads to more efficient environments, thus positively affecting the virtualization and density metrics.” How hardened those cloud hosting services are—safe from hacking, that is—is, we imagine, a matter under review inside the Pentagon. That 5 percent figure, incidentally, comes from 2009, indicating another source of frustration noted by the GAO evaluators—namely, that almost all the agencies in question have been slow to provide relevant, up-to-date data. One issue, GAO observes, is that some of the agencies in question are “decentralized,” so that cumulative data are hard to come by. Another, an objection raised particularly by the Department of Transportation, is that many data centers are housed in leased space without “dedicated metering” or uniform measures of performance and savings. One implication is that owners of leased property, if not the agencies themselves, may be required to put such measures in place. The report recommends pointedly that all of the agencies take steps to improve their reporting and forecasting. This is especially pressing, the report adds, because of federal FITARA requirements that agencies calculate annual cost savings as part of an overall strategy to improve efficiencies and reduce costs.